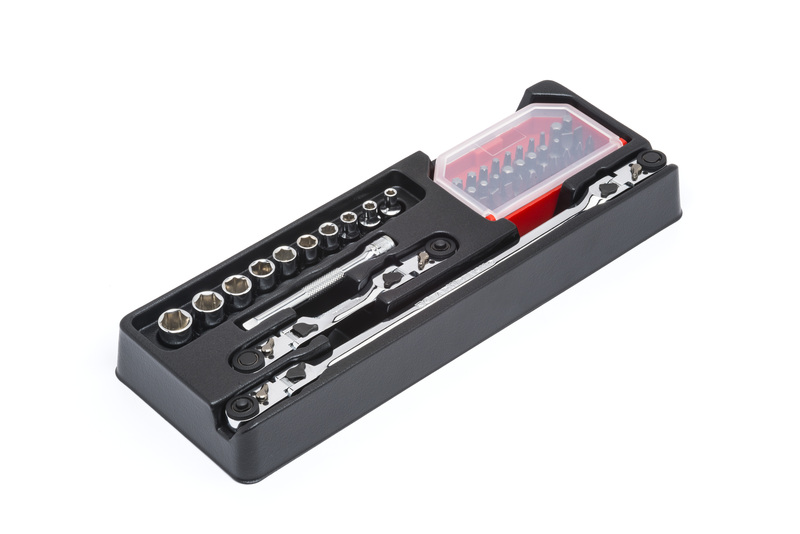 SPARKS, MD – GearWrench®, a premier hand tool brand known for tools that deliver speed, strength, and access to automotive technicians, today introduced a 43-piece 1/4″ Drive Multi-Function Ratchet Set. Today GearWrench added a 43-piece 1/4″ Drive Multi-Function Ratchet Set to its product line; integral to the set are the Compact Multi-Function Ratchet and Long Multi-Function Ratchet. The ratchets are the stars of the set. The 1/4″ Drive Compact Multi-Function Ratchet is designed to fit comfortably in technicians’ hands and still allow them to apply ample torque, while the Long Multi-Function Ratchet makes accessing to tough-to-reach screws and bolts easy. Each end of both of the Multi-Function Ratchets features a locking flex head for greater control, allowing the user to stay on the fastener. There’s no need to hold the back of the ratchet head in place, allowing for access to even the tightest spaces. The Multi-Function Ratchet gear design exceeds ASME torque performance requirements. Both ratchets are covered under the GearWrench Lifetime Warranty. For more information, please visit www.GearWrench.com.